The Darkest Minds is a 2018 American dystopian science fiction thriller film directed by Jennifer Yuh Nelson, and written by Chad Hodge, based on Alexandra Bracken's young adult novel of the same name. The film stars Amandla Stenberg, Harris Dickinson, Mandy Moore, and Gwendoline Christie, and follows a group of teenagers who are on the run from the government after mysteriously obtaining superpowers. The film was released in the United States on August 3, 2018, by 20th Century Fox. It received negative reviews from critics and grossed $41.1 million worldwide against its $34 million production budget. A contagious disease called Idiopathic Adolescent Acute Neurodegeneration kills nearly 90% of the children throughout the United States, leaving the survivors with unusual abilities. As a result, the government place the survivors in "rehabilitation camps", where they attempt to control them. The children are identified by color groups based on their abilities: Green (super intelligence), Blue (telekinesis), Gold (electrokinesis), Red (pyrokinesis) and Orange (psionic ability). Reds and Oranges are considered so dangerous to others that they are ordered exterminated. Ruby Daly celebrates her tenth birthday with her family. Seeing her parents' concern about the disease, Ruby goes to comfort them in the night, touching their hands, and inadvertently erasing all their memories of her existence. In the morning, her mother has no recollection of Ruby, calling the authorities to come and take her away. Taken to a rehabilitation camp, Ruby is examined by Dr. Viceroy. When he tests show she is an Orange, he prepares to euthanize her, but Ruby instinctively uses her abilities to convince him that she is a Green. Six years later, Ruby is found out to be an Orange when the camp's sadistic Captain realizes she is not super intelligent. The Captain uses a captured Red to kill Dr. Viceroy for his mistake. Cate, a worker at the camp, reveals herself to be part of the Children's League, an organization that uses the survivors as soldiers to fight against the government, and helps Ruby escape. Cate provides Ruby with a panic button that can be activated as a tracker if she is in danger. When Ruby gets visions while touching Rob, another League member, she becomes suspicious of their intentions. Ruby makes her escape with a mute little girl named Suzume (Zu), a Gold. Zu takes Ruby to Liam, a Blue, and his friend Charles (Chubs) a Green. The three agree to let Ruby join them as they try to make their way to "East River", a purported safe haven led by an Orange named Slip Kid. The four enter an abandoned mall to gather supplies, where they cross paths with another group of survivors. The others know where East River is, but the only clue they reveal – due to a subtle influence of Ruby's power – are the letters "E D O". Chubs eventually deduces that this is a radio frequency, which reveals a transmission that East River is in Lake Prince, Virginia. Journeying to East River, Ruby and Liam begin to develop a romantic connection, but Ruby refuses to touch him, fearing that her powers will hurt him. At East River, Slip Kid is revealed to be the president's son, Clancy Gray, who is an Orange. He teaches Ruby how to control her powers, and in turn, has Ruby teach him how to erase people's memories. During this process, Clancy controls her mind and kisses her. It is revealed that Clancy is using his powers to control the government, and wants to use his new memory-erasing powers to turn Ruby to his side and forget her friends, but she manages to escape with the others. Liam flees with all of the haven kids, while Ruby faces off against Clancy, destroying the camp and making her escape with Chubs. Chubs is severely injured, leaving Ruby no choice but to use her panic button to call the League for help. The League gets Chubs to a hospital, and lets Zu leave with a protective family. Ruby convinces Cate to release Liam in return for taking his place as a soldier in the League. Knowing that Liam will never leave without her, Ruby kisses him and erases all of his memories of her. Liam leaves the camp, while Ruby begins her training with her fellow powered kids in the League. Elsewhere, Clancy looks over his army of government forces. 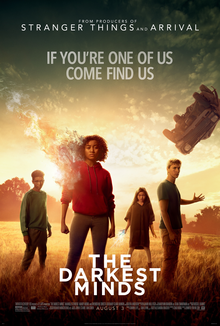 On September 15, 2014, it was announced that 20th Century Fox had bought the film rights to Alexandra Bracken's young adult novel The Darkest Minds, the first book in her The Darkest Minds series. Shawn Levy would produce the film along with Dan Levine and Dan Cohen through his 21 Laps Entertainment, while the television writer Chad Hodge was hired to write the adaptation. On July 12, 2016, it was reported that animation director Jennifer Yuh Nelson had been hired to direct the film, and it would be her first live-action project. On September 26, 2016, Amandla Stenberg joined the film to play the lead role of Ruby Daly, a 15-year-old girl who runs away from her government camp and joins a group of teens. On January 17, 2017, it was reported that newcomer Harris Dickinson had signed on to play Liam, who also develops superpowers surviving the disease. In February 2017, Miya Cech was cast in her debut film to play Zu, and Skylan Brooks was cast in the film to play Chubs. In March 2017, Mandy Moore was cast to play Cate, a doctor and member of an organization who is fighting against the government, and Patrick Gibson was cast to play Clancy Gray, the president's handsome son, whose posters are all over the camp for being “cured” of his powers. He also has the power of seeing into people's minds. Gwendoline Christie was also cast in the film to play a bounty hunter of teens who escape from the camp. In April 2017, Golden Brooks joined the film to play the mother of Daly. Principal photography on the film began in April 2017 in Atlanta, Georgia. The Darkest Minds has grossed $12.7 million in the United States and Canada, and $28.4 million in other territories, for a total worldwide gross of $41.1 million, against a production budget of $34 million. In the United States and Canada, The Darkest Minds was released on August 3, 2018, alongside Christopher Robin, The Spy Who Dumped Me and Death of a Nation: Can We Save America a Second Time?, and was originally projected to gross around $10 million from 3,127 theaters in its opening weekend. However after grossing $2.3 million on its first day, including $550,000 from Thursday night previews, weekend estimates were lowered to $6 million. It went on to debut $5.8 million, finishing eighth at the box office and marking the 12th worst opening for a film playing in over 3,000 theaters. It dropped 64% to $2.1 million in its second weekend, finishing 12th. In its third weekend, the film grossed $255,173 and was pulled from 2,679 theaters (85.6%, 3,127 to 448), marking the largest third-weekend theater drop in history, beating Live by Night's record of 2,659. On review aggregation website Rotten Tomatoes, the film holds an approval rating of 17% based on 117 reviews, with an average rating of 4.1/10. The website's critical consensus reads, "The Darkest Minds does little to differentiate itself in a crowded field of YA adaptations, leaving all but the least demanding viewers feeling dystopian déjà vu." However, the audience rating for the movie was much higher, holding a 76% on the same site. On Metacritic, the film has a weighted average score of 39 out of 100, based on reviews from 28 critics, indicating "generally unfavorable reviews". Audiences polled by CinemaScore gave the film an average grade of "B" on an A+ to F scale. A.A. Dowd of The A.V. Club called the film "a formulaic hodgepodge of secondhand plot points" and "an insult to its target demographic" of teen moviegoers. William Bibbiani of TheWrap praised the film and the cast, but concedes "it's not quite thrilling enough [...] so it plays a bit more like a manifesto than a sci-fi thriller." Monica Castillo of RogerEbert.com wrote that while the film has a "promising start", it "ultimately doesn’t quite deliver." While the film is based on the first of four novels, three novellas and three short stories in The Darkest Minds series, and the film’s ending sets the stage for future action, and director Jennifer Yuh Nelson stated that she would be happy to return for a second film in the series, no definitive plans have been announced, and were reported to be unlikely given the poor box office performance of the film. ^ a b c "The Darkest Minds (2018)". Box Office Mojo. IMDb. Retrieved October 17, 2018. ^ Kit, Borys (September 15, 2014). "'Wayward Pines' Creator Tapped to Adapt 'Darkest Minds' (Exclusive)". The Hollywood Reporter. Prometheus Global Media. Retrieved April 30, 2017. ^ Kit, Borys (July 12, 2016). "'Kung Fu Panda' Director Jennifer Yuh Nelson to Make Live-Action Debut With 'Darkest Minds'". The Hollywood Reporter. Prometheus Global Media. Retrieved April 30, 2017. ^ Kit, Borys (September 26, 2016). "Amandla Stenberg to Star in Fox's YA Adaptation of 'Darkest Minds' (Exclusive)". The Hollywood Reporter. Prometheus Global Media. Retrieved May 8, 2017. ^ Patten, Dominic (January 17, 2017). "Harris Dickinson To Star In Fox's YA Adaptation Of 'Darkest Minds'". Deadline Hollywood. Penske Business Media. Retrieved May 8, 2017. ^ N'Duka, Amanda (February 1, 2017). "Miya Cech Joins Fox's 'The Darkest Minds'; Noah Centineo Cast In 'Sierra Burgess Is A Loser'". Deadline Hollywood. Penske Business Media. Retrieved May 8, 2017. ^ Rought, Karen (February 19, 2017). "'The Darkest Minds' movie adaptation has found its Chubs". Hypable. Retrieved May 8, 2017. ^ McNary, Dave (March 7, 2017). "Mandy Moore Joins Amandla Stenberg in Dystopian Thriller 'Darkest Minds'". Variety. Penske Business Media. Retrieved May 8, 2017. ^ Lodderhose, Diana (March 13, 2017). "'The OA' Star Patrick Gibson Heads To Fox's 'The Darkest Minds'". Deadline Hollywood. Penske Business Media. Retrieved May 8, 2017. ^ Kit, Borys (March 22, 2017). "Gwendoline Christie Joins Sci-Fi Thriller 'Darkest Minds' (Exclusive)". The Hollywood Reporter. Prometheus Global Media. Retrieved May 8, 2017. ^ McNary, Dave (April 4, 2017). "Golden Brooks Joins Amandla Stenberg's Dystopian Thriller 'Darkest Minds' (EXCLUSIVE)". Variety. Penske Business Media. Retrieved May 8, 2017. ^ Walljasper, Matt (April 26, 2017). "What's filming in Atlanta now? Simon Vs. the Homo Sapiens Agenda, The Last Full Measure, Darkest Minds, plus how a looming WGA strike could threaten Georgia". Atlanta. Retrieved April 30, 2017. ^ "What's Filming in Atlanta Now?". On Location Vacations. Retrieved April 30, 2017. ^ "Casting Call for Kids and Adults in ATL for "The Darkest Minds" Sc-Fi Movie". Auditions Free. April 26, 2017. Retrieved April 30, 2017. ^ Rubin, Rebecca (August 1, 2018). "Box Office: Can Disney's 'Christopher Robin' Top 'Mission: Impossible – Fallout'?". Variety. Penske Business Media. Retrieved August 1, 2018. ^ a b D'Alessandro, Anthony (August 4, 2018). "'Tom Cruise's $34M 'Mission' Takes Out 'Christopher Robin' — Saturday AM". Deadline Hollywood. Penske Business Media. Retrieved August 4, 2018. ^ D'Alessandro, Anthony (August 12, 2018). "'August Audiences Get Hooked On 'Meg' Shelling Out $44.5M". Deadline Hollywood. Penske Business Media. Retrieved August 12, 2018. ^ "Biggest Theater Drops". Box Office Mojo. IMDb. Retrieved August 21, 2018. ^ "The Darkest Minds (2018)". Rotten Tomatoes. Fandango Media. Retrieved September 26, 2018. ^ "The Darkest Minds Reviews". Metacritic. CBS Interactive. Retrieved August 21, 2018. ^ Dowd, A.A. (2018-08-03). "Angsty teens deserve better than the bootleg-X-Men melodrama of The Darkest Minds". The A.V. Club. Retrieved 2018-10-06. ^ Bibbiani, William (July 30, 2018). "'The Darkest Minds' Film Review: YA Tale Delivers Its Allegories With Crisp Efficiency". TheWrap. Retrieved August 21, 2018. ^ Castillo, Monica (2018-08-03). "The Darkest Minds". RogerEbert.com. Retrieved 2018-10-06. ^ Wakeman, Gregory (2018-08-14). "Will there be a 'Darkest Minds 2'? Here's what we know". Metro. Retrieved 2019-04-15. ^ LaSalle, Mick (2018-08-02). "'Darkest Minds' — don't wait for the sequel". San Francisco Chronicle. Retrieved 2019-04-15.